Much of our health care system has been based on the Germ Theory, which simply speaking says that germs cause disease and if we kill the bad germs we will get healthy. We now know that this theory is flawed. Our attempt to wipe out “bugs” has created an assault on our immune systems, leads to a minimum of 10,000 deaths per year, according to The Telegraph and has created a generation of dangerous “Superbugs” that threaten the well-being of society. Understanding The Interference Principle will help you maximize your ability to heal from injuries and health problems and achieve optimum health and peak performance levels. The Interference Principle is comprised of the following scientific and philosophical premises that should be applied to the health care and lifestyle of you and your loved ones. You have within you an Innate Intelligence. Present from the moment you were conceived, this intelligence grew you from 1 cell into over 80 quadrillion cells that were organized and specialized to keep you healthy and functioning at your highest level throughout your lifetime. 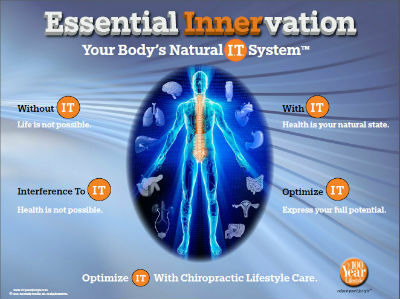 This Innate Intelligence guides the processes in your body that turn food into cells, eliminate waste products, coordinate muscle contraction and communicate with or without your conscious thought to every cell, tissue and organ of your body via your nervous system.